Thanks for taking the time to visit our website. You are probably reading this because you are after something that ‘little bit different’? Well if so, you have come to the right place! Everyone at Silk Street Swing is passionate about making your event stand out from all the rest by delivering professional entertainment and an experience that exceeds your expectation. Silk Street Swing formed back in 2009, following on from the success of our dixieland jazz band, the Silk Street Jazz. Silk Street Swing travel all over the UK and have performed at many prestigious venues. 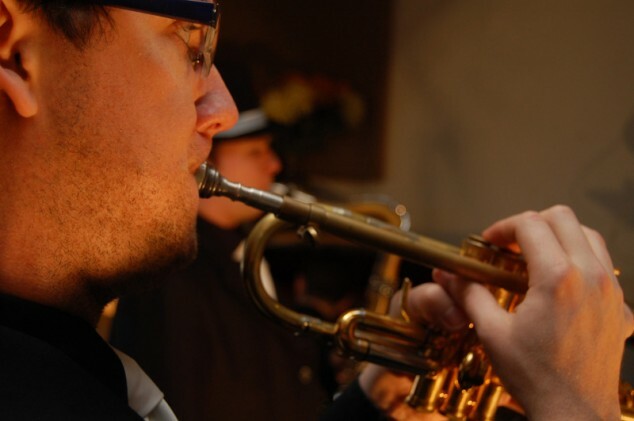 Although our band members are full time professionals and some of the leading musicians in their field, we understand how important your event is to you and we aim to enhance it every way. Whilst we have recorded extensively for TV, including programmes and commercials for the BBC and Channel 4, we’d be more than happy to appear in your party or wedding video so you can remember how special the day was. We perform at hundreds of events each and every year. If you would like to hire the Swing Band for your wedding, private party, or corporate event, then we would be delighted to hear from you. We offer a friendly, personal, unrivalled service and realise the importance of cost. Unlike many other bands, we have a guaranteed booking service and plenty of feedback from happy customers. If you are planning a forthcoming event then please get in touch and we will be delighted to help.